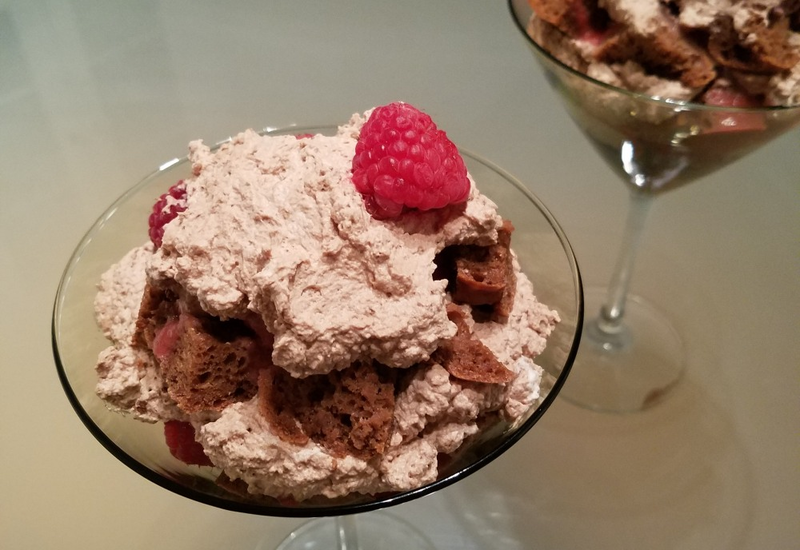 Who knew a healthy dessert could be so decadent? This trifle is filled with layers of gluten-free chocolate cake, whipped chocolate cream, and fresh raspberries, drizzled with raspberry sauce and will delight with every bite. Best of all, there's no refined sugar. Using maple syrup provides a complex, caramelized sweetness to the cake and chocolate cream. Perfect for your next dinner party, you can also serve the trifle in individual portions: simply layer the cake, chocolate cream and raspberries in tall glasses or Mason jars instead of a large glass bowl. For a sweet cake without any sugar, use ¼ cup granulated sweetener and ½ cup applesauce instead of maple syrup. Blueberries, blackberries or cherries can be also substituted for raspberries, or use a combination of mixed berries for pretty presentation. Per Serving: 879 calories; 60g fat; 74.4g carbohydrates; 14g protein; 228mg cholesterol; 234mg sodium. This dessert dish was much easier than I anticipated, and was also very delicious. The fact that it was sugar free was a win! I've been trying to cut back, and it's sometimes so difficult to find good ideas. I really enjoyed this and want to make again. Made this for my wife for our weekly date night. We both really liked it. The raspberry flavors were really good. She didn't believe me when I told her it was sugar free! Definitely will make this again.